Marine and coastal areas are complex spaces which complicate stewardship in these areas. Our seas are, in many ways, open access and have less-defined property rights compared to terrestrial landscapes. Many of us, when we look at the sea, see an expanse of blue – not comprehending the 3D environment that operates below the surface. Furthermore, in the coastal region, there is often no clear boundary between the land, the sea and humans. 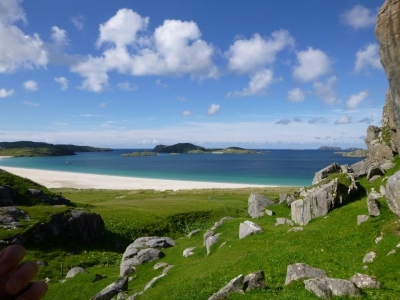 An example of the complexity of seas and coasts can be illustrated by machair - a fertile and low-lying dune grassland which is particularly prevalent in the Outer Hebrides, Scotland. Machair grassland has been framed by legislation as a ‘natural’ habitat, listed in the Habitats Directive as a habitat worthy of protection, and yet machair would not exist without humans or the sea. Seaweed, cast onto the shore by Hebridean storms, is gathered by crofters and ploughed into the machair to act as a fertiliser and binding agent for the light soils. Nonetheless it is only the machair grassland which is conserved even though it is only one part of the wider machair system. The in-bye (land allocated to each croft) and the moor (common grazings land) are not deemed worthy of protection even though the ecological value of the machair grassland would be adversely affected by a lack of human input through crofting. Applying stewardship in contexts such as this is challenging. There is currently no overarching definition of ‘marine and coastal ecosystem stewardship’ and there have been no explicit attempts at using the concept of landscape or ecosystem stewardship in a marine context. In research into stewardship of marine resources, there is much use of concepts such as ‘ecosystem-based approach’, ‘adaptive governance’ and ‘institutional entrepreneurs’. In application, there has often been a focus upon stewardship of specific sectors, particularly fisheries (e.g. as seen by the Marine Stewardship Council which recognises and rewards sustainable fishing practices). However, the landscape stewardship principles of simultaneously improving cultural heritage, food production, biodiversity conservation and other landscape values; including deliberative planning, policy and management; being highly participatory; and valuing a diversity of perspectives and ‘ways of knowing’ have in many cases been used singularly, but never collectively. Now is the time to ask: what does marine and coastal stewardship mean and how do we establish it in practice?